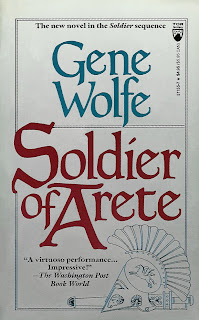 Latro continues his journey across ancient Greece in search of his memory in Gene Wolfe’s second entry in the “Soldier” series _Soldier of Arete_. As implied in my review of _Soldier of the Mist_ I am finding this series to be the easiest for me to ‘get into’ of all of Gene Wolfe’s work that I’ve read thus far. I think it’s because many of the elements Wolfe employs in nearly all of his fiction really seem to make sense here. Latro is naïve and ‘unreliable’ as a narrator, but he’s suffering from memory loss due to brain trauma…I can accept that a lot easier than I can the apparent naïvete of characters like Severian (an apprentice torturer and would-be saviour), Silk (an annoying man-child saint)or Able (a young boy transported to a fantasy world, but a boy who seems to have grown up in some kind of very sheltered ‘Leave it to Beaver’ childhood…he certainly never seemed to have the experience I would expect of even a ten-year-old from the modern era). When those characters ‘leave something out’ of the tale they are telling it seems willful to me, Wolfe purposely obfuscating the narrative via his narrative tool, but when Latro does it I can accept it as a natural part of the story due to the fact that he just can’t help it, he really does try to be the best reporter of the events going on around him that he can. Of course this is all really just smoke and mirrors: Latro is just as much the ‘narrative tool’ of Wolfe as the others and giving me a ‘plausible’ excuse for accepting unreliability from him as a character perhaps doesn’t really mean that he has any significant difference from Wolfe’s other protagonists, he is still performing the same ‘sleight of hand’, but somehow it does make a difference to me. I'm willing to accept Latro for who he is and I find that much more difficult with Wolfe's other protagonists. Wolfe’s ever-present erudition is also on full display in this volume (as in the previous) and we are immersed into the world of ancient Greece at the time of the Graeco-Persian wars. As is usual with Wolfe he pulls no punches and much is left for the reader to make sense of on their own, though Latro’s own need to explain some things to himself in his scrolls, as well as my own interest in the civilizations of this era, made the often frustrating obfuscation and explanation-by-way-of-implication endemic to Wolfe less of an issue for me here. Be warned that spoilers for _Soldier of the Mist_ follow. The previous volume ended in a cliffhanger: upon leaving the besieged city of Sestos Latro was tricked into a battle that seemed likely to kill him. Although he managed to survive (he is touched by the gods after all) and met a dying soldier who seemed to recognize him, calling out the name “Lucius” only to expire before he could enlighten him beyond this, Latro seems to be no closer to finding his home and identity than he was before. Latro is once again thrown into companionship with some old friends (and enemies) and this time journeys across Thrace, through Athens, and finally to Sparta guided both by the hands of the gods and those in whose company he finds himself. It becomes even more obvious here that Latro is a pawn, both of the gods and the other people with whom he must live. I’m still not sure what the end game of the former group is, or why they view Latro as such an important tool. The human players are much easier to read as they jockey for political and personal power and see Latro’s abilities (both as a soldier and as one who can see the invisible world) as useful tools for reaching their objectives. It is interesting to see that a character like Latro, one who loses the memory of each day as it recedes into the past, is actually still capable of growth. I would definitely say that the Latro of Arete is a slightly different man from the Latro of Mist and the sorrow and perplexity of his condition are truly beginning to weigh on him. It is also touching to see the way in which many of the people around him truly care for this man (though he would be, and is, horrified at their pity of him) and much of the manipulation of Latro is done with the best of intentions, “for his own good”. Deep down in his heart, though, Latro appears to know better what it is that he needs and how he ought to live and thus, in the end, he makes his own decisions about what he shall do and where he shall go…perhaps to his own detriment, but even a man with no memory wants to feel that he has made his own choices, however well-intentioned the choices made on his behalf by others. 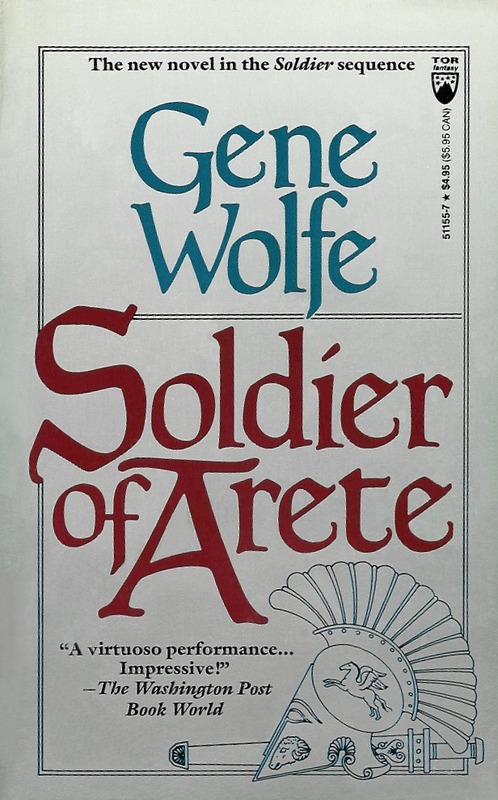 The ending of this volume is an even bigger cliffhanger than the one in Mist and the last chapter is even told in slightly confusing poetic prose by a character other than Latro…a flourish of Wolfe’s that no doubt left the readers at the time of publication thoroughly frustrated (these readers would be forced to wait 17 years for the final volume of the series, a volume that they perhaps never even expected to appear). While this could be validly considered a typically Wolfean ending to a series loaded with ambiguity I am glad that I have the third volume at hand and can see where Latro finds himself in the final fragment of his story without further delay.